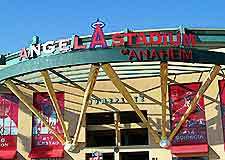 Anaheim's Angel 'A' Stadium, a huge ballpark seating up to 45,000 spectators. 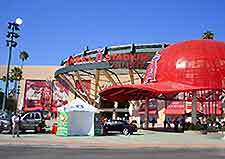 Close-up of the main entrance and the Angel 'A' Stadium. 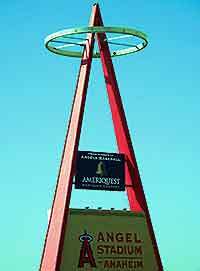 The giant 'A' frame scoreboard at the Angel 'A' Stadium, earning it the nickname of 'Big A'. 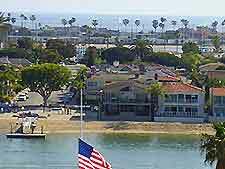 Aerial view of a beach area close to the city center. 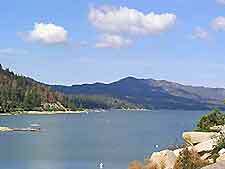 Stunning scenery at Big Bear Lake, around two hours' drive from Orange County. 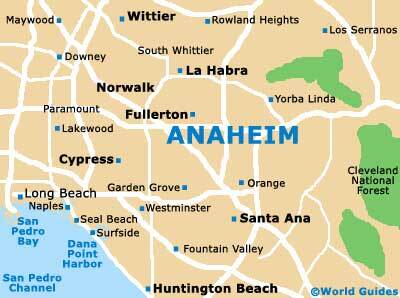 Anaheim is full of exotic palm trees. 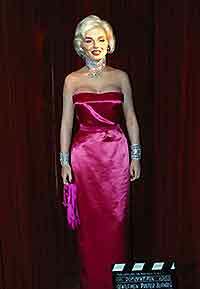 The Movieland Wax Museum, featuring hundreds of waxwork models of movie stars and celebrities, including Marilyn Monroe. Waxwork models of the original Star Wars cast at the Movieland Wax Museum. 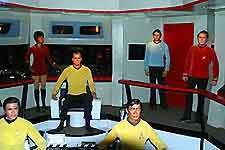 The original Star Trek crew, one of the most popular attractions at the Movieland Wax Museum.